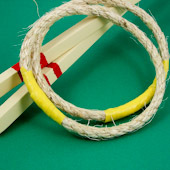 In this project, you will make rings and stakes for the game of ring toss. Rules for the game are included. This is a terrific activity for families or groups; it can be played indoors or outdoors. Make a set to have on hand for picnics, cookouts and parties. Included at the end of the project are the rules for playing Ring Toss. Also, learn about the origins of Ring Toss. Optional supplies: Paint, marker, water bottles, plastic cups, and sand. Make four to eight rings. Cut a length of rope 15" long for each ring. Adults only: It is easier to cut rope with a utility knife. 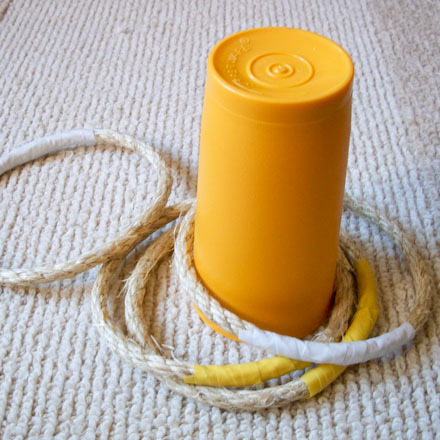 To make a ring, join the two ends of a piece of rope in a circle and wrap with tape. Use a short piece of tape to hold the ends together, then wrap a longer piece of tape tightly around the rope to secure the ends. Use two different colors of electrical tape, wrapping half of the rings with one color and the other half with the second color. If you use masking tape, color the masking tape on half of the rings one color and give the remaining rings a second color. 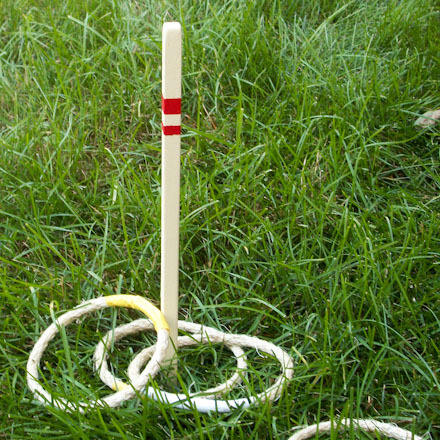 To play ring toss outdoors, you will need two stakes to drive into the ground. For each stake, cut a 1/2" dowel rod or other stick to 15" long. Make one end pointed by whittling it with a utility knife. Sand the stake smooth. The stake will last longer if it is painted. For indoor stakes, take two empty water bottles and fill them with sand or gravel. Screw the lids on tightly and tape to secure. Now you are ready for a game! At the end of the project are the rules for playing Ring Toss. Also, learn about the origins of Ring Toss. That's it! Now you can play a game of ring toss! What are the origins of the game of Ring Toss? Games of skill originated as a way to learn the coordination needed to hunt. Although we have no record of them, these games probably originated in prehistoric times. We know from recent history that Native American children played many games that perfected their ability to throw, run, and aim. 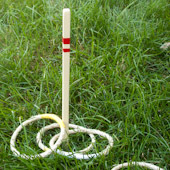 The game of ring toss probably developed from the British game of quoits. 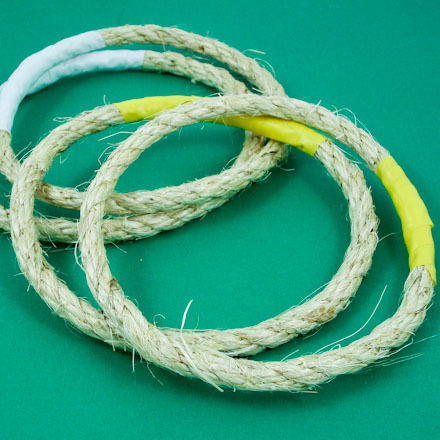 Quoits are light metal rings about six inches across. Players toss the quoits at iron "hobs" placed 18 yards apart. There are records of quoits being played as early as the 14th century, and the game may have developed from the Greek sport of discus throwing. The British and other Europeans spread the game of quoits as they explored and colonized. There is a Peruvian legend about an Incan king who was murdered while playing quoits with the Spanish conquistadores. 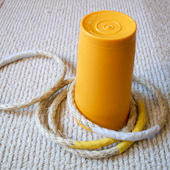 An indoor version of quoits was popular with children during the 19th century. It was played on a portable wooden playing bed with up to nine hobs. Our game of ring toss is based on this incarnation. Here's what you need: Four or eight rings (half one color, half another), two stakes, and a score sheet. Number of players: Two players or teams. With four or more players, split into two teams. Object of game: To be the first player or team to reach an agreed-upon total score: usually 50 to 100 points. Before you start: Make the rings and stakes from this project. Find a place to play—outdoors or indoors. Arrange the stakes six or more feet apart. Flip a coin to see who goes first. Half of the players stand by each stake. Each player/team throws their chosen color of rings at the opposite stake. Players/teams alternate turns, throwing one ring at a time until all rings have been thrown. Score 5 points for each ringer and 3 points for any ring touching the stake, and score one point for a ring within 6" of the stake and closer than an opponent's ring. Pick up the rings and continue playing until one player/team reaches the target score. 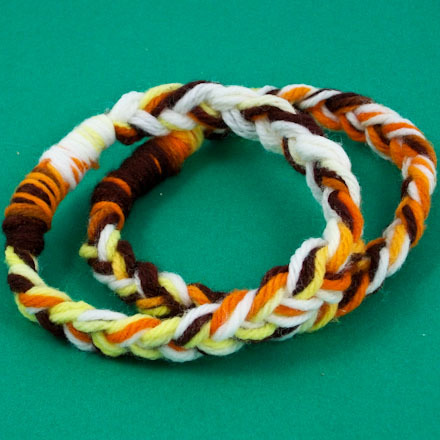 Tip: Make two sets of rings by wrapping the rings in two different colors of tape. 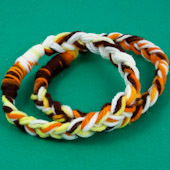 Tip: Rings can also be made by braiding 12 or more pieces of yarn to make a rope, and wrapping yarn over the ends to join the braid into a ring. Tip: A plastic cup, turned upside-down, can be used as an indoor stake. Tip: Drive the stake at least three inches into the ground.